Keratin color uses Unique Collagen Care Complex and Skin Flattering Pigments to deliver intense hair dye color and fuller looking hair in just 30 minutes! Keratin Coloration acts as a treatment to help repair highly processed, damaged hair with up to 80% less hair breakage*. 20 intensive hair dye colors deliver 100% gray coverage with a low-odor coloring experience thanks to the Ammonia Control Technology. 100% GRAY COVERAGE: Gray coverage with long lasting color fidelity giving you fuller hair with up to 80% less hair breakage* (*vs. untreated hair). If your hair is longer than shoulder length, we recommend using 2 boxes of Keratin Color hair dye for the application. Ingredients: Color Creme: Aqua (Water · Eau) · Propylene Glycol · Cetyl Alcohol · Ammonium Hydroxide · Paraffinum Liquidum (Mineral Oil · Huile Minerale) · Stearyl Alcohol · Ethanolamine · Ceteareth-30 · Toluene-2 ·5-Diamine Sulfate · Hydrolyzed Collagen · Serine · Hydrolyzed Keratin Acrylamidopropyltrimonium Chloride/Acrylates Copolymer · Ammonium Sulfate · Steareth-100 · Glyceryl Stearate · Parfum (Fragrance) · Resorcinol · Sodium Sulfite · Silica · Tetrasodium EDTA · Linalool · Ascorbic Acid · Citronellol 2-Methylresorcinol · 2-Amino-3-Hydroxyridine · M-Aminophenol · Hexyl SalicylateDeveloper: Aqua (Water · Eau) · Hydrogen Peroxide · Cetearyl Alcohol · Paraffinum Liquidum (Mineral Oil · Huile Minerale) · Ceteareth-20 · Propylene Glycol · Etidronic Acid · 2 ·6-Dicarboxypyridine · Disodium Pyrophosphate · Potassium Hydroxide · Sodium BenzoatePre-Treatment: Aqua (Water · Eau) · Hydroxyethylcellulose · PPG-1-PEG-9 Lauryl Glycol Ether · Pyridoxine HCI · Sodium Benzoate · Sodium Salicylate · Parfum (Fragrance) · Hydrolyzed Collagen · Acrylamidopropyltrimonium Chloride/Acrylates Copolymer · Potassium Hydroxide · Tetramethyl Acetyloctahydronaphthalenes · Hexyl Cinnamal · CI 60730 (Ext. Violet 2) · CI 14700 (Red 4)Keratin Care Complex Conditioner: Aqua (Water · Eau) · Cetearyl Alcohol · Quaternium-87 · Propylene Glycol · Hydrolyzed Collagen · Hydrolyzed Keratin · Serine · Butyrospermum Parkii (Shea) Butter · Prunus Armeniaca (Apricot) Kernel Oil · Panthenol · Isopropyl Myristate · Distearoylethyl Hydroxyethylmonium Methosulfate · Citric Acid · Phenoxyethanol · Stearamidopropyl Dimethylamine · Parfum (Fragrance) · Polyquaternium-37 · Ceteareth-20 · Glyceryl Stearate · Sodium Methylparaben · Dicaprylyl Carbonate · Lauryl Glucoside. Instructions: Read and follow the insert instructions. I always take the Allergy test when using a new hair color product! So I preformed the test. Reading the instructions I found out they suggest not washing your hair prior to use or not to use if your hair has been colored with henna or metal dye. The color I'm using is Schwarzkopf Keratin Color anti age Caramel Blonde. I had enough dye for my shoulder length hair, if your hair is longer I would recommend two boxes if you want the dye to cover sufficiently. 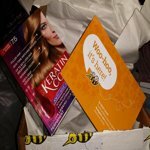 The Schwarzkopf Keratin Color box states less odor experience, I found this to be true, this was a more pleasant experience. I waited the 30 minutes, then rinsed my hair following the instructions which are easy to understand and they come in three languages. It states on the box 100% gray coverage so after my hair dried I checked the results. I very happy with the color and it covered my gray. My daughter suggusted I switch and use this color again! I do recommend Schwarzkopf Keratin Color, my experience was a happy one with good results. I got this for free to try and give my honest opinion from BzzAgent. I have never used this dye before and was reading some of the reviews after i had put it in my hair while waiting to rinse it. at that time i was very scared of what my hair was going to turn out like. I have to say that I absolutely love it. I had christmas tinsel silver gray hair highlighting my whole head and medium brown natural hair. 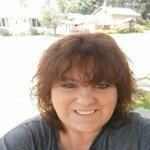 Well this makes me look 10 yrs younger as i am almost 52 right now and looked a lot older then what I am before dying it. I will continue with this dye. I hadn't dyed my hair in almost 4 yrs . Something different; what a nice surprise! I have never tried the Schwarzkopf brand hair coloring before and I was very hesitant in trying it. In fact, I didn't even open the box for three or four days because I was going to take it back to Walmart and exchange it for my usual brand. Then I got a streak of bravery and decided to try it. This is a great hair product. I used the Schwarzkopf Keratin Color Anti-Age Hair Color Kit. It comes with reassuring and very thorough directions. When I applied it, it seemed to embrace my hair very gently as it worked up into a smooth lather. The color was perfect. I wash my hair every day, but the color just seems to get better and better as it sets up in my hair. My husband even complemented me on my pretty hair color. I love this product and will definitely buy it again. This hair color was super easy to apply. It was very creamy and game good coverage. It did not have a very strong odor which I was pleased about. I got some on my skin, but it easily wiped away. The conditioner it comes with left my hair super soft. The color turned out perfect. I was a medium brown and used the Berry Brown dye. My hair went slightly darker with lovely red tones added in. I will definitely be using this again! I'm approximately 75% grey and my natural color is dark auburn. Other boxed colors have been too monotone and very drying. Professional multi-process coloring gave great coverage but at $95 a month just isn't an option. I tried the mail order custom color service and their products aren't any better than something off the shelf. I had a coupon for this product and figured it was worth a try. I've used it now for over a year and I love it! It completely colors my grey in a tone very close to the color on the box and adds a rich hue to my natural auburn strands making for a beautiful multi-tonal color that looks very natural. 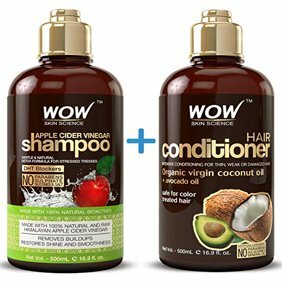 It has a healthy shine and the color lasts amazing well (although I do use a color preserving shampoo and conditioner every morning). If you're thinking about trying this product I recommend that you purchase a color 1-2 shades lighter than your natural (dark) hair color to get the multiple tones for a natural look. I don't know how this would work for people with lighter colored hair.